When you write someone or something off, you are actually belittling its value. • Most critics wrote him off as a petty artist until he received a national award. • A lot of parents tend to write creativity off as a successful career option for their children. Meaning: To be in a conflict, a violent dispute or disagreement with someone. Simply put, if two people or groups are at loggerheads, they disagree strongly about something which, most of the times, leads to an impasse or deadlock. • The opposition party is at loggerheads with the ruling government over the new bill. • Sam is at loggerheads with his mother on reducing his pocket money. We don’t get salt as salary anymore but somehow, salt is equivalent to something that a person gets as a salary for his job. So long story short, to be ‘worth one’s salt’ is to be worth one’s pay/salary. This phrase is used to compliment someone for his/her work, skills, efficiency, etc. • Any accountant worth his/her salt should be aware of the latest changes in taxation. • Any political leader worth his/her salt fulfils the promises made during the election campaign. This phrase is used when you are unsure about the importance or usefulness of the outcomes. • For what it’s worth, I think you should not trust that man. • For whatever it’s worth, at least we tried our best. • For what it’s worth, I apologize to you. Well, I hope that with these phrases, you all made some progress with your English vocabulary. 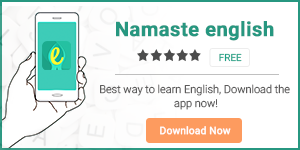 हर रोज़ EASY and EFFECTIVE English Vocabulary tips पाने के लिए download करें हमारी app HinKhoj.